The new bike lanes on Arsenal west of Grand were painted this week. We rode and drove the stretch a few times — below are some thoughts and photos. A view of the new bike lanes along Arsenal looking east. 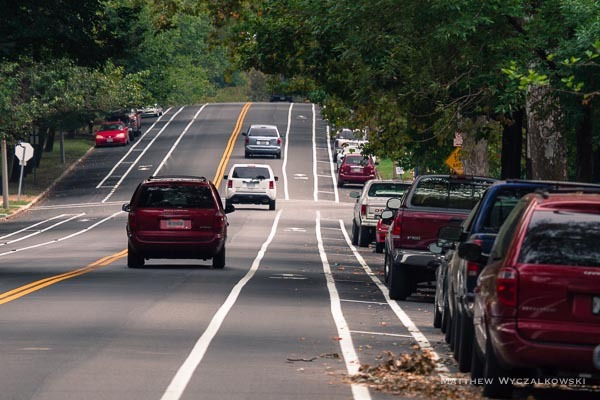 The stretch of road between Roger and Grand has been restriped to provide a 7′ parking lane, a 3′ buffer, a 5′ bike lane, and a 10′ travel lane. Cyclist eastbound on the new bike lanes. The lane position encourages cyclists to ride well away from parked cars. The buffer lane provides space between cyclists and parked cars, minimizing the likelihood of riders hitting an opening car door. The buffer space also provides pedestrians a better view of oncoming bicycle and car traffic. Intersection of Arsenal and Spring, looking west. Approaching the intersection, car parking ends and the bike lane shifts right to accommodate a left turn lane. The path cyclists should follow across the intersection is clearly marked. Intersection of Arsenal at Grand, facing east. The bike lanes stop well back of the intersection, giving cyclists space to merge to any of the three turn lanes. Parking on the right has been pushed back, although note that there is an additional, empty parking spot in front of the gray van above. Getting rid of the two parking spots past the end of the bike lane would give both cyclists and drivers more visibility and room to merge. Generally speaking, we found the path a delight to ride. 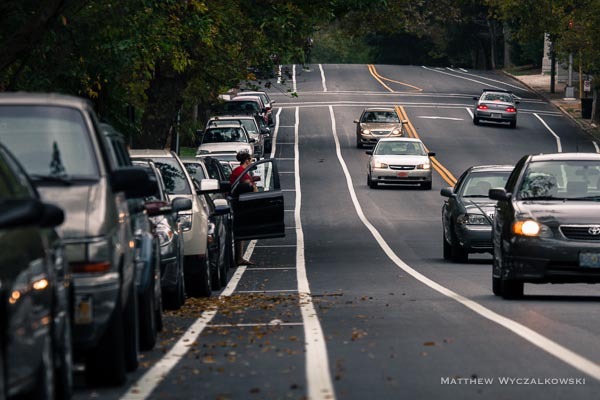 The lane placement, with a buffer strip between parked cars and the bicycle lane, gives riders plenty of room. In particular, even timid and inexperienced riders will be naturally positioned well away from parked cars and the dangerous “door zone”, something the previous lane arrangement failed to do. The intersection at Grand is complex for a variety of reasons, including limited space and heavy car and pedestrian traffic. We observed and rode the intersection several times at different times of day in moderate traffic, and found that car and bicycle traffic merged quite well. Eastbound, the bike lanes seem to end at an appropriate spot, and merging to any of the turn lanes was straightforward. Our sense is the bike lanes create an expectation of cyclists on the road, and the narrowed lane arrangement moderates car speed, making it much easier for cyclists of all skill levels to negotiate this intersection. Importantly, parking on eastbound Arsenal has been pushed back by two parking spots. This is a welcome change, and significantly improves visibility and maneuvering room for both riders and drivers. Nevertheless, two cars can still park beyond the end of bike lanes; ideally, parking would end with the bike lanes, giving cyclists more time and space to merge safely. 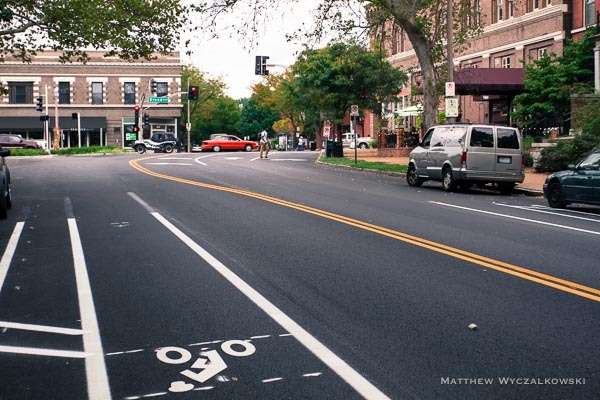 Overall we think the new bike lanes on Arsenal are a tremendous improvement, a well designed and executed addition to St. Louis’ expanding bicycle infrastructure. We drove past the new bike lanes this morning, and the “No Parking” signs are now correctly placed. Thank you Streets Department! On Monday we heard back from the St. Louis Streets Department, indicating that they’d look into the positioning of “No Parking” signs described below and make corrections. Thank you for being so responsive! We’ll continue providing updates until this issue is resolved. On the Sunday after the lanes were painted, we rode and walked the new lanes again. We were surprised to see cars and trucks parked in the bike lane on westbound Arsenal immediately before the Spring intersection. We were even more surprised to see that they were parked legally, at least judging by the signs. Truck parked in the new Arsenal bike lane, westbound Arsenal immediately before Spring. Cars and trucks parked in the bike lanes. Surprisingly, they are parked legally: the “No Parking past this point” sign is in front of the white car. It seems that the parking signage has not been updated since the new lanes have been painted, and parking is technically permitted almost until the intersection at Spring. As a result, cars can (and do) park in the bike lane as it shifts right. This appears to be a simple oversight. It can also be easily corrected, simply by placing a “No Parking past this point” sign where the bike lane shifts right, so that no parking is permitted in bike lanes. We hope the City remains responsive to cyclist safety concerns here, and will provide updates as the issue evolves. Why couldn’t they have used the parked cars to protect cyclists? It may be helpful for bikers, but car traffic on Arsenal is negatively impacted and the ratio of cars to bikers should be considered. The 3600 block of Arsenal is a high traffic volume block, both east and west bound. Without the center lane on our block, east-bound traffic on Arsenal now frequently backs up all the way to Spring because cars cannot get into the left turn lane onto Grand even when the left arrow is on. As a resident of that block who parks on the street, traffic can no longer go around me when I am trying to park and often the car behind me is so close that I can no longer back into a space when one is available. This affects property values and quality of life. Is this the final solution or is there room for compromise? Why weren’t residents informed? Thank you for this careful review! On the first day they drew the lanes in (before the actual paint), merging at the Grand intersection was quite stressful as everyone jockeyed for space. I noticed that after a couple of weeks with just the markings, the intersection worked quite well, as people came to expect cyclists merging. 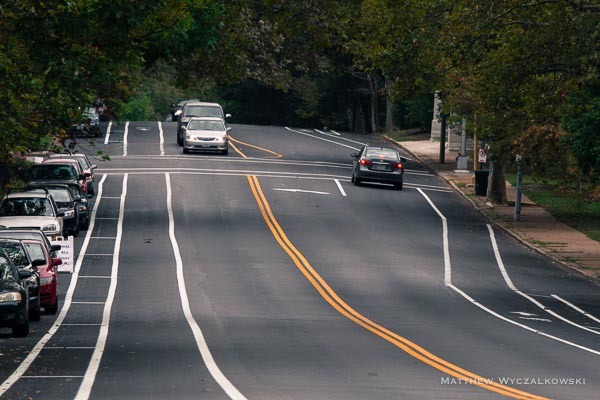 With the fully painted lanes, the street is a much a more pleasant place to ride and live. What is the policy/law when it comes to making right turns that involve crossing into the bike lane. When I travel east on Arsenal and want to turn right onto Gustine, I often veer to the right, once I’ve passed the parked cars, passing the cars going straight, so as to get to the corner to turn right. The bike lane has a solid line that turns dotted a few yards from the corner. Is it illegal to pull to the right before the dotted line starts? Of course I would not do so if a bike were coming up behind me! I wondered if there were traffic laws pertaining to this. I encounter the same dilemma heading south on Grand when I want to turn west onto Arsenal. Anyone have more insight into this issue? 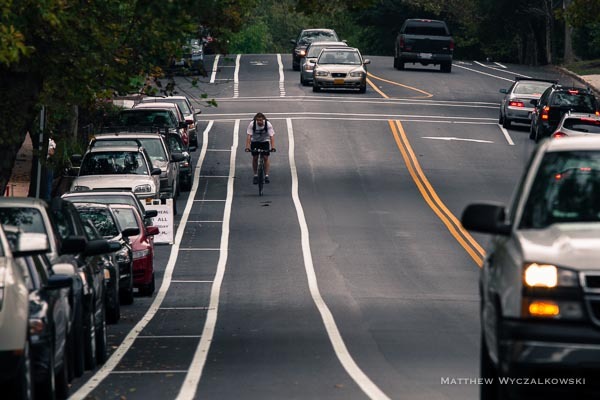 Why were you surprised to find cars parked in bike lane? That is not an uncommon occurrence for even bike lanes that have been in place for some time, let alone a new one in area where residents and park users have parked for years. There are always meetings and hearings regarding proposed bike lanes and traffic issues in the city. I get my info from Trailnet.org who’s website keeps readers up to date with what meetings about are where they are located. The public are invited to voice their opinions and we need more voices. I have limited sympathy for those who choose street parking in this section of Arsenal. I’ve lived on Arsenal for 30 years & have always utilized the garage. I am not sure, but I believe that every property in the 3600 block has a parking pad or garage in the rear. With 35″ of frontage for each lot, plus an equivalent amount of space available on the north side of Arsenal, each building has the capacity to park 4 vehicles on the street, and one or two in the rear. Admittedly, the Creamery and MoKaBe’s utilize many of the spaces, but that’s the price of having thriving businesses in an urban setting. I am not a biker (rather a walking commuter, so I am definitely at the bottom of the totem pole)but I welcome the bicycle lanes. I feel that our corner of St. Louis has become much more livable and attractive over the past 5 years due to the increased number of cyclists. I hope the city continues to encourage cycling. Any update on the parking signage? 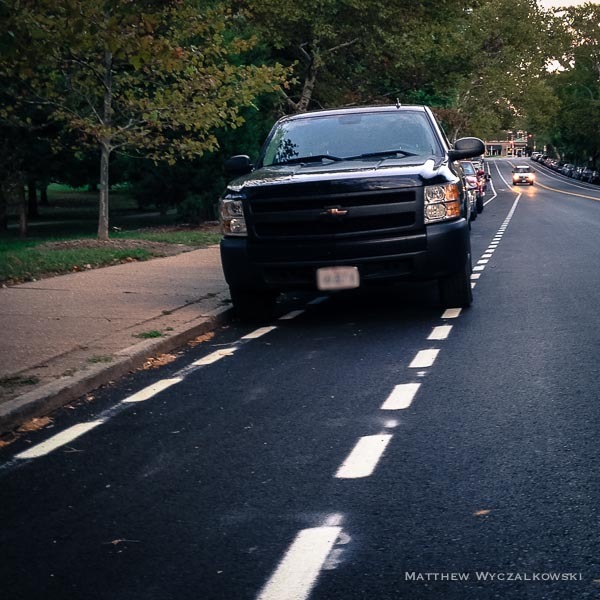 Has it been moved so that parking in bike lanes is no longer legal? 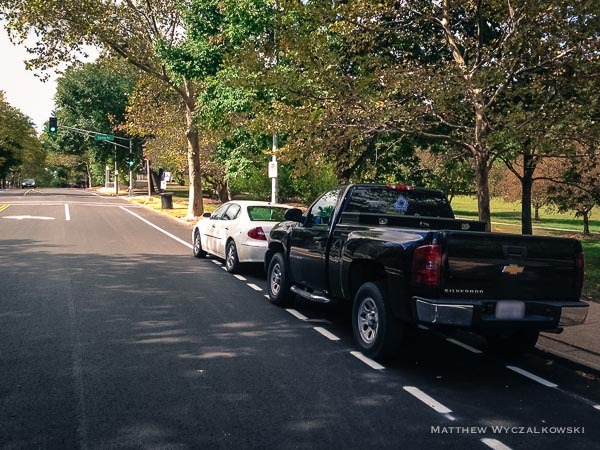 Parking in bike lanes is never legal, and last fall when this issue came up the Streets Department ticketed heavily to get the message across. Are there any more problems? Today the rest of Arsenal south of the Park is getting buffered bike lanes. Any thoughts? 1 Pings/Trackbacks for "New bike lanes on Arsenal: a review"